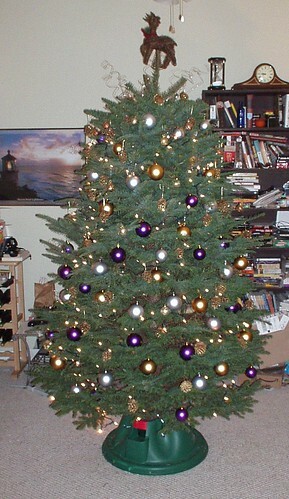 Those who have visited me over the holidays (and you are few; I don't entertain often) know that since becoming single I haven't yet put up a Christmas tree. This has been rectified. Click if you want to see a larger version. I took several photos of the festivities this Thanksgiving, and wanted to post the non-incriminating ones here for all to enjoy. I just had to share Mom's artistry with everyone. Is it even necessary to mention it tasted as good as it looks? Matt and I agreed to help Mom take the first steps in decorating the Christmas tree this year in exchange for room, board and, of course, pie. 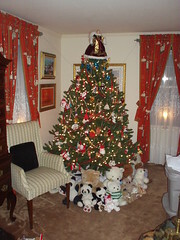 Mom will have added three times as many ornaments to the tree as seen here by the time it's finished. 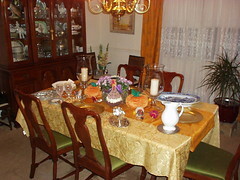 This is a (sadly after the fact) picture of the table Mom set for the dinner proper. 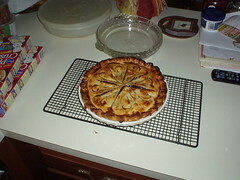 Mom never does anything by halves. 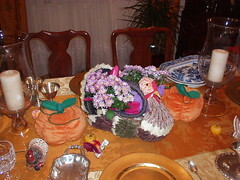 Mom was especially proud of the new centerpiece she received from a friend this year. Matt and I procured chrysanthemums with which to fill it. 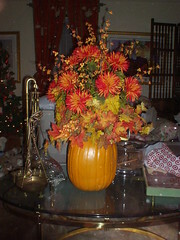 This is another centerpiece Mom received from a friend. It's about four feet tall, so in order to facilitate conversation over dinner, Mom moved this to another room. 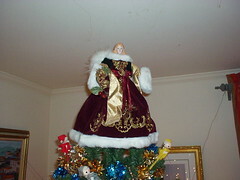 It just seemed like a good idea to snap a close-up of the tree's topping angel. Final NaNoWriMo word count: 28,534. Far short of the goal, but I'm pleased anyway. I've updated the excerpt on my NaNoWriMo profile page with the end I settled for, in order to have one. It's clunky, and a bit more of a summation than a narrative, but I love how it came out, and the thematic stuff I figured out to do with everything, moving forward. There's lots I need to do to finish this story. But I will do it. I haven't been so excited about writing in... Well, ever. PS. Changed the working name of the thing to Braintape Dreaming.